IRMA-17 is a tropical cyclone that is approaching slowly, through the Atlantic, to the western part of the Caribbean. This cyclone originated on 30 August 2017 as a tropical storm and on 31st August got intensified with increasing winds from 100km/h to 185km/h. As of 4 September 2017, IRMA-17 is located about 900km east of the Leeward Islands. Maximum sustained winds are 222km/h, a Category 3. According to the expected cyclone track, the center of Irma is forecasted to approach the northern Leeward Islands late Tuesday. 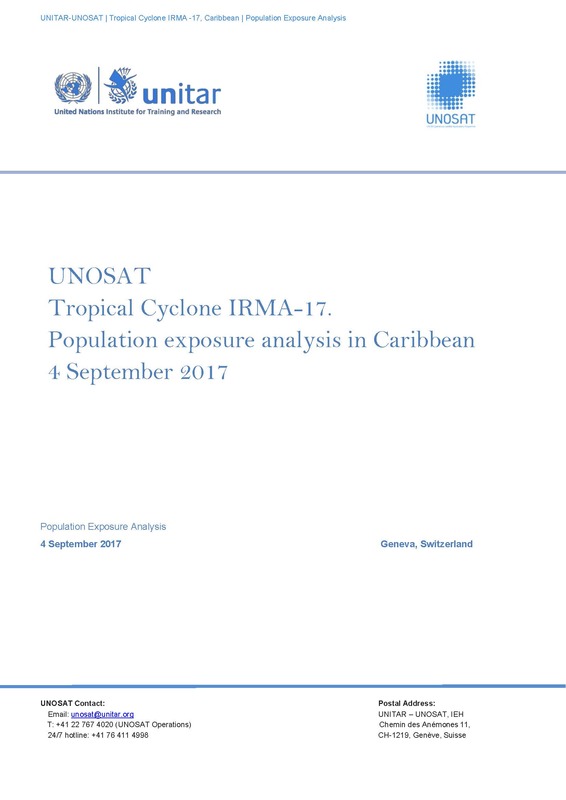 Based on data of the predicted tropical cyclone path, wind speeds from JRC (Warning 21 issued on 4 September 2017 at 15:00 UTC), and population data from WorldPop, UNITAR-UNOSAT conducted a population exposure analysis for Caribbean, where 427,000 people are living within 120km/h wind speed zone and 13,500,000 within wind speed zone of 90 km/h.